Any person living in US is used to one thing – carrying a piece of paper having directions from either Google maps or MapQuest – while traveling to a new place, even if it is a supermarket less than half a mile away. And with most new cars having GPS systems installed, you now have a lady in sweet voice constantly letting you know the right directions. But this is the case in countries like US and UK where the roads and naming conventions are structured and organized. What about India? Is it possible to have such a system in India? I am not sure if it is entirely possible, given the unorganized and inconsistent naming standards of the Indian roads. Infact, forget the naming standards, most of the roads don’t even have names. There are always multiple combinations possible to go from anywhere to anywhere with similar distances. Then is it possible to have similar online road directions services in India as in the West? Yahoo recently announced their maps and location services covering most of the top cities in India. Yahoo seems to be looking to take a lead in this ahead of Google maps, as they are still in a very early stage. There are also other two Indian startups in fray – RouteGuru and MapMyIndia. I carried out some tests for fun to see how these services work and here are the results. I took some easy and known places in Pune to not send them in a tizzy. I was pleasantly surprised with the results that Yahoo gave. Although, in normal circumstances, I would not have taken this route if I had to travel, it was pretty close to what I had expected. The most surprising aspect was how they detailed out the directions. Something like “Take 4th Left (past Hindustan Petroleum Petrol Pump on the right), go 0.2 km”, is actually quite amazing. 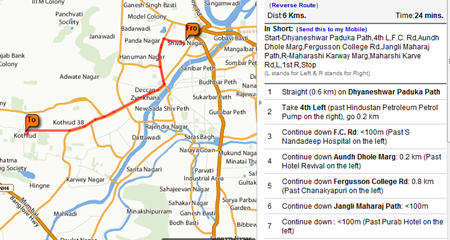 I could not use routeguru for same directions as they still are available for Delhi only. 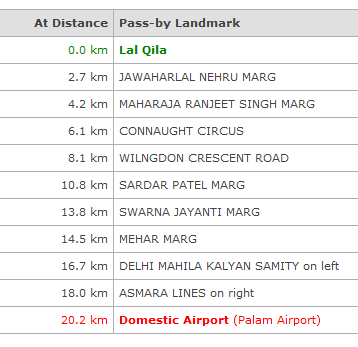 I tried doing arbitrary search from Lal Qila to Palam Airport and the directions although quite detailed, were quite over whelming. But luckily they had something called as RouteHints, that broke nearly 3 page (28 points) long directions into nifty half page landmark based directions. Neat work guys. My only worry with detailed directions is the sheer amount of work needed to keep the database up to date. And we are talking only about Delhi right now. In places like Pune or Bangalore, it is going to be extremely difficult. 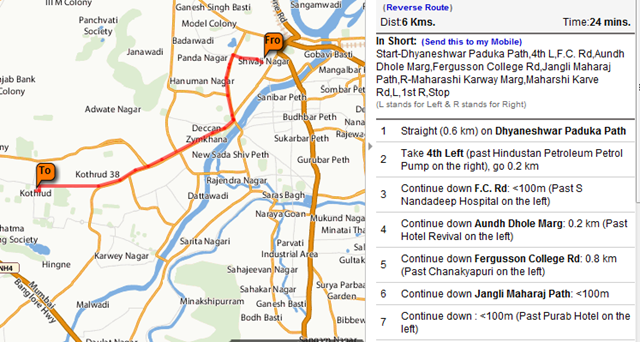 I used the same directions with mapmyindia as with Yahoo Maps and they came up with decent results too. The directions were quite different from what Yahoo maps showed me and that’s expected. Also, if I would not have taken this route either if I had traveled myself. The logic used to calculate distance and routes will vary with different service providers and so will the directions. I thought results given by Yahoo were better, but it cannot be generalized. Some results may be better with yahoo, while some better with MapmyIndia. 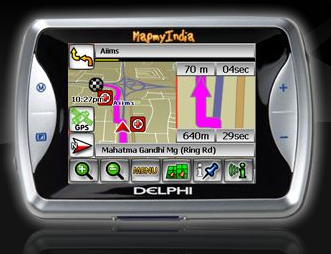 However, what caught my eye with MapmyIndia was their GPS device that they put up on sale on their site. This smart and sleek GPS gadget uses satellites to determine your current location. Enter any destination across India, and the Navigator will guide you, turn by turn, with graphical map instructions supported by voice prompts. Search for points of interest along the way, such as the nearest petrol pump when you are out of gas, or ATM when you are out of cash. I think it is quite unique and has the wow factor to it, but for Rs. 21000 a pop, I think it is only for select few people. check it and let me know, what you think about it. nice post, i must say. Let me first say that you guys are doing a awesome job with RouteGuru. Although overwhelming, the detailed directions you guys gave were pretty spot on. And with Indian roads, it is quite difficult to do that. But at the same time you need to expand fast in other cities. Companies like Google and Yahoo can turnaround things fast for obvious reasons. Its interesting to learn your keen interest in Indian startup community & to understand the close watch you keep over related startups. This is the first entry where all the three related GIS companies are compared at one place. However, I thought you might be interested in looking down at this analysis as well.